When most people think of Southern California, they immediately conjure up images of Los Angeles or San Diego or, perhaps, for the desert and Coachella lovers among us, Palm Springs. However, for real aficionados of the Southern California lifestyle, the aforementioned metropolitan hubs are merely promising previews of the treasures to be beheld in the southernmost territory of the Golden State. With that thought in mind, I set off on a quick tour of the islands of Southern California which may not be as flashy as their big city counterparts, but are no less stunning in their appeal. Nor are they in any way lacking in the qualities that make SoCal living so uncommonly exceptional. Even perched among all of Southern California’s many splendored assets, Coronado Island has a singular sparkle that sets it apart. A sunshine-drenched oasis located just across the bay from Downtown San Diego, Coronado is one of America’s most stunning beach communities. On the surface, it’s an upscale village dressed up in the allure of small-town America and bedazzled with spectacular beaches, near-perfect weather year-round and bewitching sunsets. However, at its core, there is a magic beyond the superficial about this little island just north of Mexico that lends itself to memory-making. Whether being conveyed by gondola through the island’s scenic canals, shopping and dining at the multitude of hotspots along Orange Avenue (the town’s main thoroughfare), lolling about on any of the destination’s pristine, award-winning shores or spending a day sailing along the coast on a catamaran, Coronado unfolds a fairy-tale like experience that is almost Disney-esque in its charms. 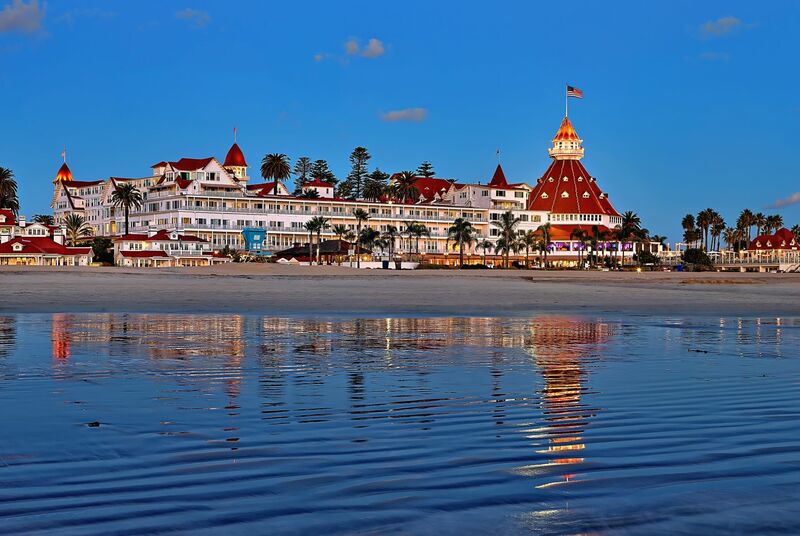 At the center of it all is the Hotel del Coronado, the island’s grande dame, the tale of which is so inextricably intertwined with the history of the destination that it is impossible to talk about one without discussing the other. 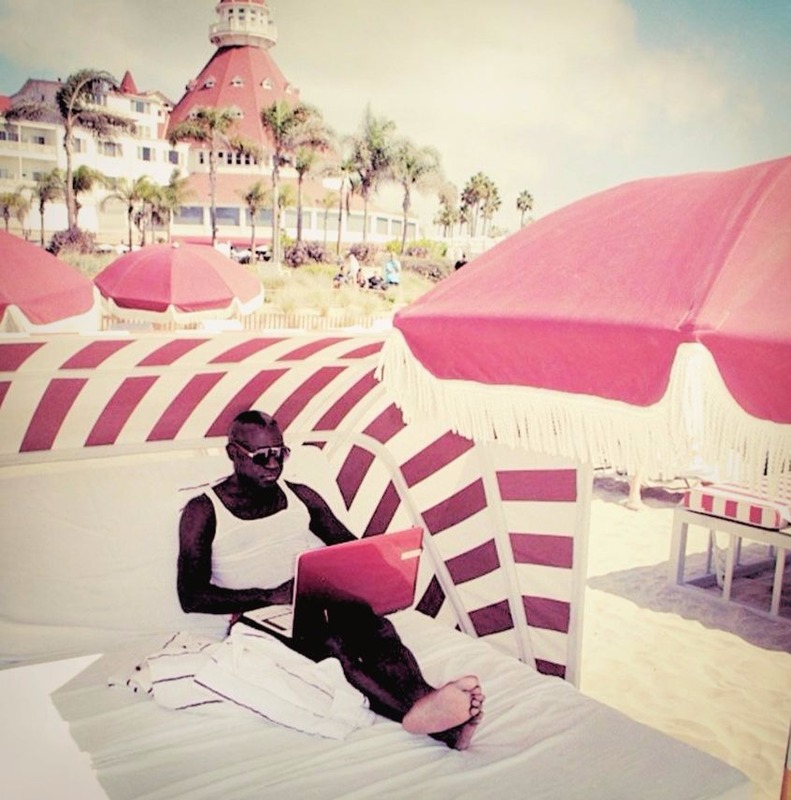 Debuting in 1888, the Hotel del Coronado, or The Del as it is affectionately known to locals and regular guests, sparked the initial development of the island at the turn of the century and throughout the years has attracted everyone from presidents to Hollywood superstars. Nowadays, The Del is a major tourist attraction draped in memorabilia and populated by an array of chic restaurants and boutiques. For first time visitors, a tour and a bite at any of the hotel’s many boites will suffice as a decent introduction, but in order to fully experience the real charm of the Hotel del Coronado (and indeed of Coronado itself) a stay at this uniquely Southern California property is a must. Combining work with a picture-perfect setting. While in the main resort building, the ocean view rooms headline the list of accommodations, from a pure luxury perspective, the property’s real stars are to be found in the relatively new and simply styled “Beach Village at The Del” – 78 amenities-laden, oceanfront guest rooms configured into one to three-bedroom suites. Wildly popular though it may be, the resort side of the property, for all its appeal, can at times become mildly overrun with tourists but such is never the case at Beach Village. A separate valet entrance greets guests of the Village, along with a personal concierge, exclusive swimming pools and whirlpools and full access to the hotel’s Windsor Beach Club. Add to the above the fact that every suite in the Beach Village is situated right on the sand sans any barrier between guests, the beach and regularly jaw-dropping sunsets and you start to understand why this corner of paradise is among the most sought after on the island. 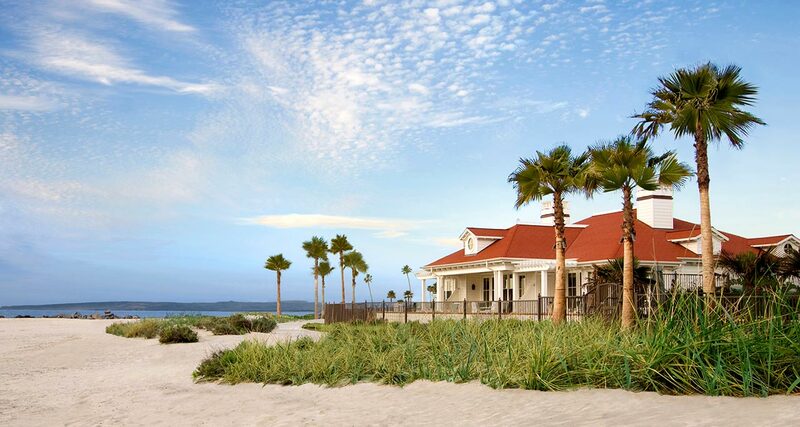 For more information about Coronado Island, click here. The private and exclusive Kona Kai Beach at Kona Kai Resort, Shelter Island. Nothing makes me happier than a wonderful surprise, which is exactly how I would describe Shelter Island. Also located on the outskirts of San Diego, Shelter Island is technically not so much an island as it is a part of the Point Loma Peninsula. However, technicalities aside, this wonderfully retro slice of Shangri-la very much evokes the feel of an isle, despite being connected to the mainland by a narrow strip of land. Thanks in large part to its quirky history, the buildings on this man-made Island reference a Polynesian theme (circa 1950) as dictated by city code. Towering, swaying palm trees, marinas studded by an array of yachts and superyachts and a singular ribbon of Tiki Modern inspired hotels, clubs and resorts running along the island’s shores, lend a decidedly tropical air to the destination that is reminiscent of a ramshackle relation of Antigua or Mallorca. In fact, but for the skyscrapers of Downtown San Diego seductively beckoning across the Bay, it might be quite easy to forget that Southern California is even nearby once safely ensconced in the embrace of the island with the breeze at your back and a fruity cocktail in hand. Lobby at the Kona Kai Resort, Shelter Island, California. 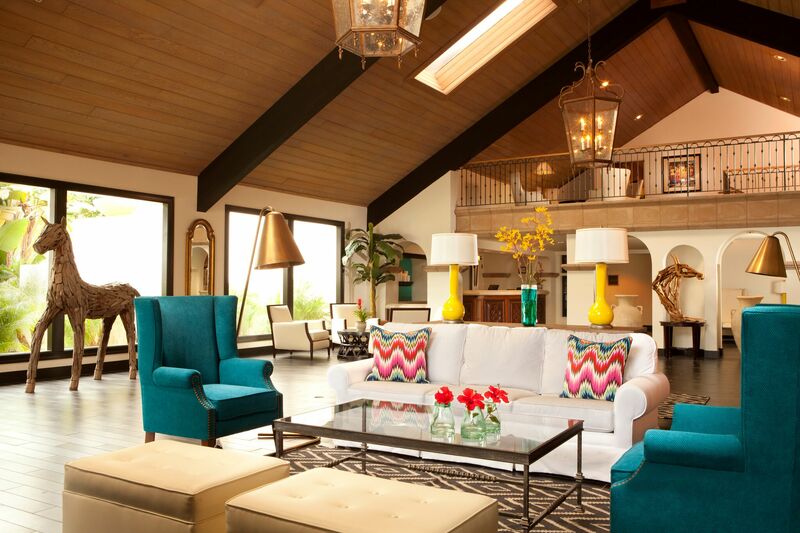 Just as Coronado has its grande dame, so does Shelter Island in the form of the Kona Kai Resort, a part of the Noble House Hotels & Resorts Collection. Located at the very tip of the island, the recently renovated Kona Kai is a boutique property that has, throughout its many incarnations, managed to maintain the Polynesian flair of the original structure while simultaneously adding a healthy dose of modernity. As eclectic in its décor as it is practical in some of its more structural elements (the property’s impressive marina is the closest to San Diego Bay and counts among its many amenities over 500 boat slips as well as a private club membership for tenants), Kona Kai is perhaps most distinguished by the fact that it genuinely embraces the notion of escape. A private sand beach (one of the few in California), a small but formidable spa, and a surprisingly delicious restaurant called Vessel, boasting gorgeous views of the marina along with a mouthwatering menu of “California Comfort Fare” highlighted by an otherworldly Lobster Mac n’ Cheese and an outstandingly flavorful and creative Porcini Crusted Sea Bass, all come together to create the kind of property that can be all things to all people. 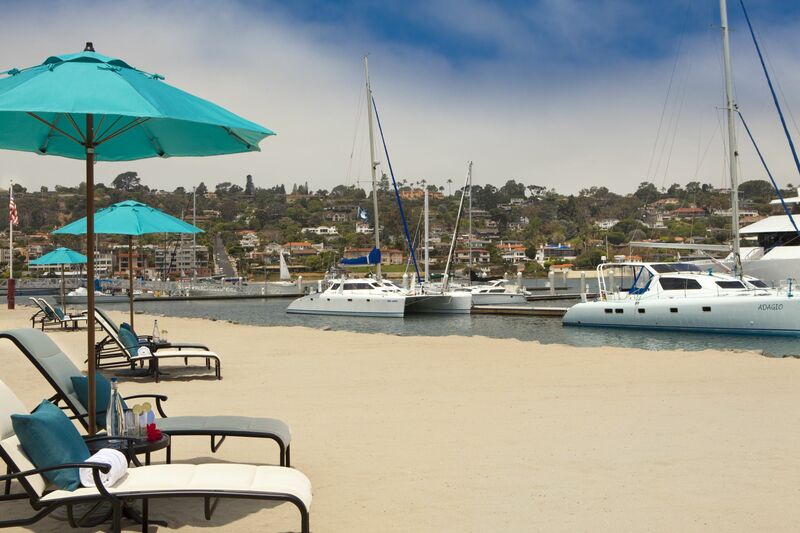 Whether you opt to walk along the marina, relax on the beach or by the pool, take an exercise class or have a workout at the gym, enjoy cocktails on the terrace of your room or nip into one of the live musical performances at Vessel, you’ll find that Kona Kai is one stop shop for escape. That said, while you’re in the neighborhood, you might also want to stop in for a drink at the legendary Humphrey’s Half Moon Inn, just down the street. An epic example of Tiki Modern architecture, the Half Moon Inn is also conveniently adjoined by the famed Humphrey’s Concerts by the Bay outdoor music venue which is well-known for hosting a diverse line-up of acts ranging from Patti Labelle, Ringo Starr, Bob Dylan, Mavis Staples and The Temptations to The Cult, Indigo Girls, Violent Femmes, Dave Koz and Culture Club.  For more information about Shelter Island, click here. I’ve written about Catalina Island often because I continue to believe it to be one of a handful of getaways bordering Los Angeles that never ceases to make for a fun day trip or a quick escape. Accessible by private boat, ferry or helicopter, Santa Catalina is a 21-mile island located just 22 miles off the coast of Southern California (though psychologically it might as well be a world away). Largely undeveloped save for Avalon Bay, the getaway’s most popular (and populous) destination, and Two Harbors, located on the more remote west end of the island, there are large swaths of Catalina around which wild buffalo still roam free in unspoiled environs ripe with opportunities for adventure and exploration. This scenic setting once made the island a popular backdrop for classic films like Treasure Island and Mutiny on the Bounty starring Clark Gable. However, nowadays this gem of an escape is primarily a laidback, attitude-free, beach town where cars are scarce, golf carts are plentiful and the scent of suntan lotion, sea and sand is pervasive. To be sure, the trifle shops and ice cream parlors along Avalon’s main drag fall are quite camp and touristy but then again that is part of the island’s easy-going, almost self-effacing charm. 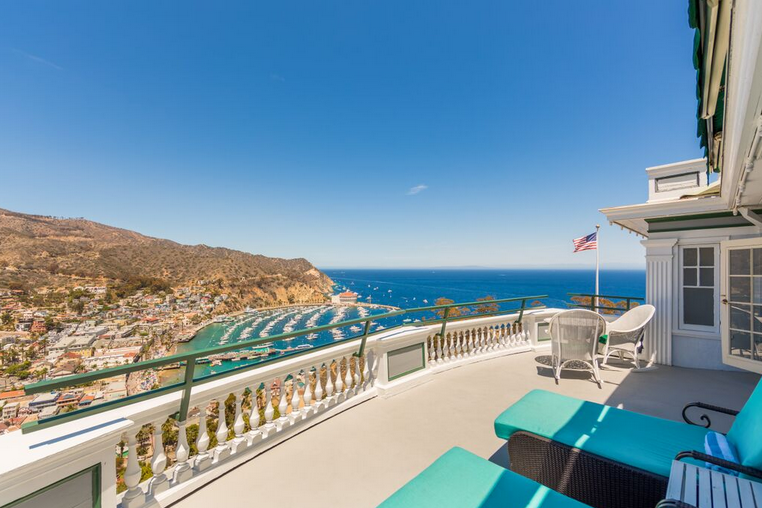 When it comes to accommodations on Catalina, the premiere destination is the Mt. Ada Inn, a boutique property that was formerly the home of William Wrigley, Jr. (of the chewing gum fortune) and his wife Ada, after whom the property is named. Set high above the tiny metropolis below with its scores of tourists, the Mt. Ada is an old-school oasis of calm offering sweeping views of both the island and the Avalon Bay. In addition to its six classically kitted out rooms ranging from a very grand, Grande Suite to a more rustic Garden Porch (“Sleeping Porch”), the Mt. Ada property claims among its many first-rate amenities: Private transportation and luggage service from the island’s heliport; access to the tennis courts at the Catalina Country Club; complimentary green fees at the Catalina Island Golf Course; access to the Island Spa Catalina pool, hot tub, relaxation deck and fitness classes; and priority cabana and chaise lounge booking at Descanso Beach Club, the island’s swell private beach club (one of the best places to while away an afternoon in Avalon, particularly if a cabana and butler service are involved). 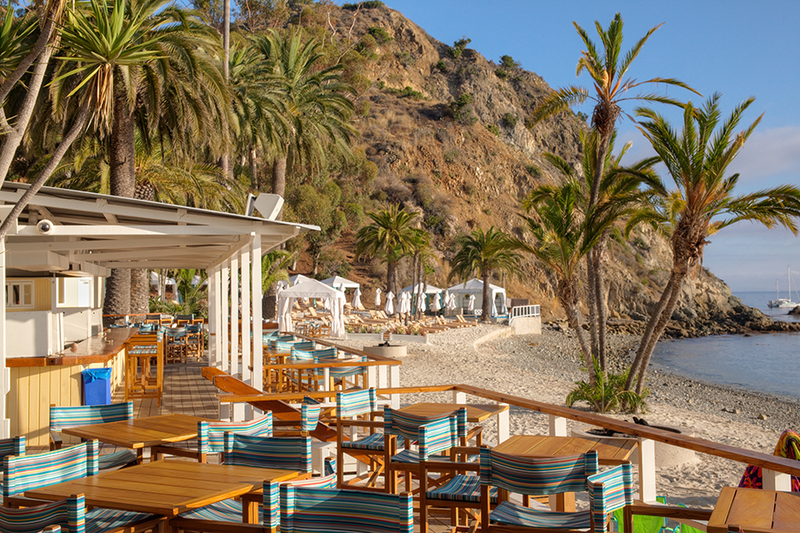 For more about Catalina Island, click here.